now there are only two. Many out-of-towners found lodging at the Dale Hotel on one side of the street and at the Brown Hotel that was on the corner of East Broad and North Goodpasture Street, the place where Brown's Flower Shop is located today. Noted far and wide, the Brown Hotel had a fine reputation for its homelike atmosphere and delicious home-style meals that were served to guests in the old-fashioned dining room. The owners were Tom W. Brown and his wife, Aribelle Brown, better known as Belle Brown. Tom Brown once taught school at Hilham and married one of his students, Aribelle, whose maiden name was Reeser. 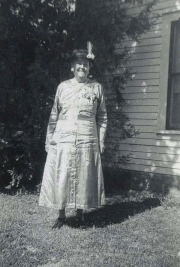 Mrs. Belle Brown, the first postmistress at the Allons Post Office, was a great granddaughter of Moses Fisk. Tom and Belle Brown were the parents of 10 children, one of whom was named Albert Wales Brown but was nicknamed "Mike". He got the nickname from a big, blond Irishman named Mike, who worked with a road crew and boarded with Mrs. Belle Brown during the time the road was being built from Livingston to Celina. 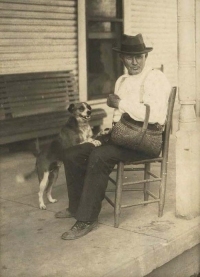 He stayed at the boarding house for over a year while the road was under construction, and during that time, Albert Wales Brown and the big Irishman took a real liking to each other, spending time together at the end of each work day. When the road project was completed and Mike the Irishman moved on, Albert Wales Brown missed him terribly, asking every day, "Where's Mike?" And he wound up being called "Little Mike" for a time, and as he grew up, the name Mike Brown was how he was known. The boarding house consisted of 10 or 12 rooms that were rented out. An old crank-type telephone was on the wall and a potbellied stove sat in the middle of the parlor floor. Folks would gather around the stove to sing and dance while someone who was called "Peg Leg Pete" played the fiddle. 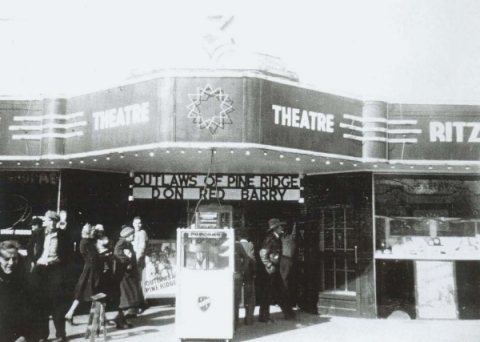 After the death of Tom Brown, who at age 38 learned he had Hodgkins disease, Mrs. Belle Brown and her son, Mike, entered into a business partnership together and had what was known as the Dixie Theater constructed right next door to the Brown Hotel. Together they got a loan at the local bank in the amount of $250 to have the theater built. theater business was sinful, and the idea that their daughter was married into a family that ran such an establishment didn¹t set well with them at all. 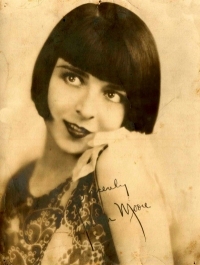 her he had named his daughter Colleen Moore Brown, and in turn, Ms. Moore responded to his letter by sending him an autographed picture of herself, along with a baby dress for her namesake. Brown taxi to drive him around the area when he came to Livingston from Washington. But life at the Brown Hotel and the Dixie Theater had problems as well as being a place of entertainment. Brown, and while in North Carolina, Mike went to a barber shop for a haircut. A shoe shine man who worked in the barber shop was polishing Mike's shoes while he was having his hair cut, and Mike noticed sore places on the man's arms. When he asked what was wrong, the fellow replied, "I don't rightly know, they just come up on me." Smallpox for the whole family was the result of that shoe shine, but in time, the family all recovered from this much feared disease. from the surrey and took whatever item was being purchased to the doors of the homes and businesses that were regular customers of Mrs. Qualls. 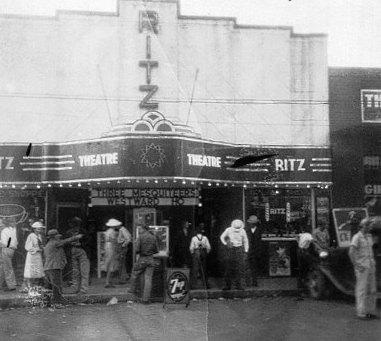 The Dixie Theater quickly became a place where crowds of people gathered, especially on Nickel Night. Many businesses around the square in Livingston would give a ticket to the theater with purchases of $3 or more, and with this ticket, plus five cents, folks could get in to see the movie. On Nickel Night, it was always a standing room only crowd. Folks would be admitted until not another person could be squeezed in, even standing up. Mrs. Clarice Brown had a soft heart when it came to little boys who had no money to get in to see the show. Colleen remembers that all a little boy had to do was drop his head and look pitiful and her mother would say, "Do you want to see the show? Well, go on in and get yourself a bag of popcorn, too." Colleen had a number of jobs over the years in the theater business, one of which an apron her mother made for her to wear was used. The apron had two pockets sewn on it, and in those two pockets, nickels were placed. It was Colleen's job to put the nickels in the player piano that played while the silent movies came across the screen. She wasn't big enough to reach the slot on the piano to place the nickels in, so she had to stand on a box. of the square, where Morgan's Department Store used to be located, and Marinella danced on the street corner while Colleen fanned her feet, something Marinella told her to do so anyone passing would think she was really doing a terrific job dancing. Then Colleen used the hat she was fanning Marinella's feet with to collect money in. They got quite a little bit of change before their mother somehow found out what was going on. Clarice Brown marched up to the street corner and got them, and all the way home, she gave each one a good whipping. Needless to say, they didn't dance on the corner anymore. As she got older, Colleen also had jobs such as popping and selling popcorn, selling tickets, and taking up tickets from customers as they came into the theater. From around the age of 10 years-old up until she finished high school, she was involved in helping run the theater. Friday nights were also the night Grand Old Opry stars would come to the Dixie Theater. Lots of the what we would refer to now as the older stars of the Opry made several appearances at the Dixie, and include such well known names as Minnie Pearl, Grandpa Jones, and the Everly Brothers, just to mention a few. Gene Autry appeared there once, and the famous film star, Tex Ritter, came and stayed at the Brown Hotel for a couple of weeks during his appearance at the Dixie Theater. Before Tex Ritter departed from his visit in Livingston, he bought gifts for the Brown girls. Marinella got a doll and because she was older, Colleen got a box of candy. Colleen said she was resentful of Marinella's gift because she knew when she ate all the candy, her gift would be gone, and Marinella would always be able to keep hers. climb on top of the roof above the marquee and play music while the movie was in progress at the Ritz. Crowds would gather in the street and on the sidewalk near the Ritz to listen to the music. traveling salesman who represented the big movie companies such as Metro-Golden-Mayer, and the films were sent by mail to the theater. Stage shows were performed after the first movie, and then that same movie would be shown again. The theater had a very unique system that cooled the building in the summer, and although Chamler doesn't know for certain, he believes Mike Brown invented the mechanism that was used to keep the building cool. where the bowling alley of Livingston was once, and on which Sunset Drive-In was built. of Livingston lost a wonderful source of entertainment with that fire. When I was growing up, Saturday afternoon matinees were always on at the Ritz, and that was the place myself, my two brothers, and most of the neighborhood kids could be found. It would probably be impossible to tell the number of times we all watched Roy Rogers and Dale Evans ride off happily into the sunset while singing "Happy Trails to You!" Betty Lou (Johnson) Copeland had the idea for this article, and I wish to thank her for suggesting it to me. Because of her idea, I got to spend a couple of fascinating afternoons with Colleen Peterman in Cookeville to gather information for the article. Thanks to Chamler Nolen for the pictures he shared with me, along with memories of his days at the Ritz he recalled for the article. And to Colleen Peterman, thank you so much for my visits, for lending pictures to be copied, and for being such a wonderful source of information. then the Ritz, were all very prominent and well known places in Livingston.